There’s an alarming digital divide within many companies. Marketers are developing nimble software to give customers an engaging, personalized experience, while IT departments remain focused on the legacy infrastructure. The front and back ends aren’t working together, resulting in appealing websites and apps that don’t quite deliver. We’ve arrived at this misalignment for understandable reasons. 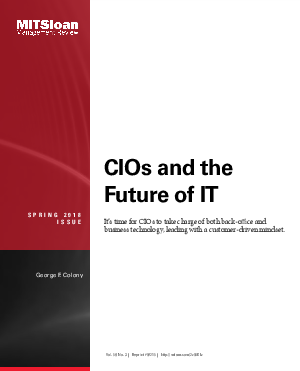 Previously, most chief information officers (CIOs) were hired to digitize and bring order to companies’ internal systems and processes. They saw websites as marketing channels and were happy to let chief marketing officers (CMOs) oversee that province of technology. They had, and still have, plenty to do just to keep internal operations running smoothly. Marketers soon got into the habit of developing not just content, but also software programs to better reach and transact with customers. But now that websites and apps are becoming cornerstones of the business, the stakes are too high to allow this division to continue. The two sides of IT need to come together, driven by customer needs.